The Punjab government has decided to advance a meeting of the Cabinet to April 3 to take a decision on the retirement age of its employees. The government is considering increasing the retirement age to 60 with retrospective effect for those who have already been retired or make this proposal effective from the next financial year. The World Sikh Conference being organised by the DSGMC in New Delhi on April 10-11 was nothing but a Congress-sponsored show by “anti-Panthic forces” aimed at misguiding the masses, said SGPC chief Avtar Singh Makkar here today. Hesitant participation of the Shiromani Akali Dal (SAD) in the state-level function to observe sixth death anniversary of veteran Akali leader “Panth Rattan” Jathedar Gurcharan Singh Tohra has not gone well with his supporters. 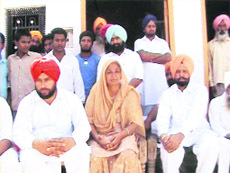 A pall of gloom has descended on Jhoke Thealsinghwala village, about 15 km from Ferozepur, after the news in connection with the death sentence awarded to one of its residents, Dharampal Singh, by a Dubai-based court spread in the area.Seventeen Indians, including Dharampal, have been sentenced to death by a Dubai-based court for killing a Pakistani man. Hindu pilgrims from Pakistan favour liberal visas to those travelling to India for a pilgrimage, said Govindram Makhija, head of a 243-member Hindhu group of pilgrims from Pakistan. In three years from today, over 65,000 out-of-school children in Punjab should be in classrooms, over 11,000 posts of teacher should be filled and almost 8,000 unrecognised private schools should be recognised. The implementation of the Right To Education Act began across the country today and the state Education Department is gearing up for the challenge. District scrutiny committees responsible for checking the details of the record 32 lakh members recruited by the Punjab Pradesh Congress Committee (PPCC) have been reconstituted following complaints that they were formed to cater to interests of the ruling dispensation in the PPCC only. Thousands of members of Indian community, particularly Sikhs, will stage a dharna in front of Indian embassy office at Milan in Italy tomorrow and will take out march to lodge their protest against alleged unsatisfying working of the embassy and misconduct of a section of officials working in the same. The authorities seem to be running the Food and Supplies Department according to their whims, as some decisions have been taken by a section of senior functionaries without the required approval of the state Cabinet and other departments. While the Right to Education (RTE) Act mandates improvement in quality education and proper infrastructure in schools, the government elementary school at Sanjay Nagar in the heart of the city here is overcrowded and short of teachers. It is something not to do with crusade against social evils, but about curbing mass copying by community participation that included educationists, professionals and families of students appearing in the ongoing secondary-level class exams of the Punjab School Education Board. Impressed with the success of Bihar's "Super 30" programme for rural students,Punjab is set to replicate the model here to facilitate its marginalised and underprivileged students to crack the entrance test of India's prestigious Indian Institute of Technology (IIT). In protest against the alleged beating of former vice-president of the District Bar Association (DBA), Patiala, Kuljit Singh Aulakh by supporters of Akali MLA from Ajnala (Amritsar) Amarpal Singh Bonni on March 31, the DBA has decided to observe a full-day strike tomorrow. The new academic session of all schools has begun under the strict supervision of the district Education Department to ensure that all government schools run as per the new guidelines of Sarv Shiksha Abhiyan. 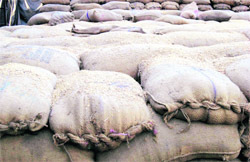 Tonnes of paddy stocks lie rotting in various shellers of the state, as the dateline fixed by the Centre ended yesterday (March 31). Banana was once considered an unviable crop in Punjab due to its climatic requirements. But that was in days of yore. Today, banana cultivation is spread over not less than 250 acres in the state. Though a high value crop, it was not being grown in Punjab till recently. According to sources, the government is convinced that it should increase the retirement age of its employees, as it was part of the SAD-BJP manifesto also. However, the issue now is of timing alone and there is a section, which feels this could be done in the election year of 2011-12. This, the proponents of this move feel, would fulfill the promise given to voters and also mobilise funds that would not have to be given to the retirees during a crunch period. According to the sources, the advocate general’s office has advised that the government could increase the retirement age by two years as in the case of All India Services. The measure would be effective from the date of retirement to ensure continuity in service. If this proposal goes through, besides the 2,000 odd employees, who were relieved yesterday, the proposal was likely to benefit thousands of others as the government had earlier proposed to extend the retirement age, as a one-time measure for this year only. This was, however, struck down by the Punjab and Haryana High Court for being selective, as it gave benefit to only employees who were slated to retire during the current calendar year. Following this, the government decided to relieve those due for retirement yesterday and simultaneously decided to hold a cabinet meeting on the issue on April 15 or 16. However, stung by the criticism on the issue, the government has decided to pre pone the cabinet meeting to April 3. It is to be seen how the retirement issue would be received in the cabinet this time. Last time, around both Finance Minister Manpreet Singh Badal and Food and Civil Supplies Minister Adesh Partap Singh Kairon had claimed that the proposal was anti-youth and could also prove to be a political mistake. The ministers pointed out that there was increasing resentment among the youth at the lack of employment opportunities and that increasing the retirement age would further harm the career prospects of youth. Meanwhile, former CM Amarinder Singh today alleged that the government had treated its employees in a shoddy manner over the retirement issue. He claimed that the government had been unable to increase the retirement age in the last three years in office, despite the fact that it was part of its election manifesto. He said the government’s indecisiveness was costing the people dearly. He expressed these views after paying homage to former SGPC chief and Akali stalwart Gurcharan Singh Tohra at a state-level function organised to commemorate his sixth death anniversary in Tohra village. The SGPC chief came down heavily on the Congress for meddling in Sikh affairs and said the DSGMC conference was basically a Congress convention. Lashing out at the Congress, Avtar Singh and other senior Akali leaders warned Congress to desist from playing any kind of “mischievous” role in the forthcoming SGPC elections. He alleged some forces were hell-bent on weakening the Sikh Panth and called upon the people to unite and thwart nefarious designs of such “anti-Panthic” forces. Rajya Sabha member Sukhdev Singh Dhindsa exhorted Akali activities to prepare themselves for the upcoming SGPC poll. He also castigated the Centre for discriminating against Punjab on various fronts. Significantly, a representative of SAD (Delhi) Jaswinder Singh, who was also present at the programme, told mediapersons that they were not against the SGPC. “We are against CM and his son Sukhbir Badal because they are the one who are actually weakening Sikh Panth by unnecessarily interfering in Sikhs religious affairs”, he alleged. Notably, it was for the first time that CM did not attend Tohra’s death anniversary programme. Akali leaders, however, cited medical reasons behind Badal not been able to make it to the Shardhanjali Samaroh. Earlier, while paying tributes to Tohra, SGPC chief, Dhindsa, Information and Public Relations Minister Sewa Singh Sekhwan, Transport Minister Master Mohan Lal and state Minister for Jail Hira Singh Gabria said that Tohra was a dynamic personality with core values of secularism and love for mankind. Both Chief Minister Parkash Singh Badal and Deputy Chief Minister Sukhbir Singh Badal were conspicuous by their absence - the Chief Minister on account of his ill health, while Sukhbir being abroad. The culmination of systematic and consistent sidelining of those who stood by the late Shiromani Gurdwara Parbandak Committee (SGPC) president is being viewed as having reached a point just short of a “breakdown” in relationship. After being pushed to the wall, many Tohra loyalists like Rajbir Singh Padiala, Jagtar Singh Rajla and Sucha Singh Chotepur have already switched to the Congress. Several others are contemplating a similar move. The gathering at Dana Mandi in Tohra village despite the heat suggested that Tohra is a “forgotten hero” as far as the SAD leadership is concerned. But for the people, Tohra lives in their hearts and minds. Six years after his demise, people of the area are still hoping to see the CM or the deputy CM visit Tohra’s frail and ageing widow Mata Joginder Kaur. “But for Tohra’s efforts to seek the release of Badal, who was held captive during the days of militancy, his fate could be very different. But the Badals have not given up their discriminatory attitude towards Tohra’s loyalists,” is the most common perception among Tohra’s men. The presence of SAD ministers Sewa Singh Sekwan, Ranjit Singh Brahmpura, Ajit Singh Kohar and Hira Singh Gabria, besides BJP minister Master Mohan Lal is an obvious under representation of the SAD-BJP alliance at a state-level function that has been widely advertised. A deliberate design in this cannot be overruled, especially in light of reports that leaders of the Tohra camp like his own son-in-law Harmel Singh, Sukhdev Singh Bhaur and even Gabria are feeling slighted in the party. After expelling a diehard Tohra supporter Manjit Singh Calcutta from the SAD for endorsing Manmohan Singh as Prime Minister, the “discrimination” against Tohra’s men has continued. By organising a state-level function, the SAD has attempted to prevent any revolt by Tohra’s men, yet tired to minimise the influence of this faction in the current political scenario. Though, there were several other senior leaders of the SAD present to pay tributes to Tohra, but the manner in which the state-level function has been conducted indicates that the SAD leadership, especially senior Badal continues to nurture a grudge against the “Tohrans”. To top it all, even the states bureaucracy was conspicuous by their absence. Except the Deputy Commissioner, no bureaucrat was present at the function. This is not possible in case of a state-level function unless there are indications to this effect by the political bosses. Even senior officers of the Public Relations Department, who advertised the event, gave the event a slip. Out of the four ministers, whose pictures were carried on the official advertisement, only one attended the function. Politically translated, this indicates that there could be more defection from among the “Tohrans” to the Congress prior to the next general elections. A pall of gloom has descended on Jhoke Thealsinghwala village, about 15 km from Ferozepur, after the news in connection with the death sentence awarded to one of its residents, Dharampal Singh, by a Dubai-based court spread in the area. Seventeen Indians, including Dharampal, have been sentenced to death by a Dubai-based court for killing a Pakistani man. All residents of the village have joined hands to make efforts for his safe release. They have started contacting residents of other areas so that they could put pressure on their elected representatives to do the needful to save Dharampal and others from the gallows. Dharampal got married to Ranjit Kaur about seven years ago. He has a son and a daughter. He had gone to Dubai to earn money to support his poor family. He had paid a considerable amount of money to a Jalandhar-based travel agent to move to Dubai and had been working in that country for the past two-and-a-half years. Nachhattar Singh, sarpanch of village, said they would approach Chief Minister Parkash Singh Badal and other Central leaders belonging to the state so that diplomatic channels could be used to save the lives of Dharampal and 16 others. Activists of the Vishwa Hindu Parishad (VHP) and the Bajrang Dal today burnt the flag of “Islamic fanaticism” at Sadbhawna Chowk in Dhobi bazar here in protest against awarding of death sentence to 17 Punjabis by a Sharjah Shariah court for allegedly killing a Pakistani. State secretary of the VHP Sukhpal Singh Sra alleged that this was a conspiracy that had been hatched out by the UAE to save Ajmal Kasab, an accused in Mumbai attacks in November 2008, from death sentence and get him released by putting pressure on the Indian Government. He also criticised the policy of the Indian Government with regard to adopting dilly-dallying tactics in hanging Mohammad Afzal, who had been awarded death sentence by an Indian court. He said the Indian Government had a soft policy towards these persons. Chandigarh: The Punjab Pradesh Congress Committee president Mahinder Singh Kaypee today requested the Prime Minister to personally intervene and take up the issue of leniency for the 17 Indians, including 16 Punjabis, who have been awarded death sentence in the UAE. In a statement issued here today, he said a delegation of Congress men would meet the Prime Minister on the issue. Senior BJP leader and Punjab's Health and Family Welfare Minister Laxmi Kanta Chawla here today shot off a communication to Prime Minister Manmohan Singh, urging him to immediately bail out the Indians as they have reportedly been falsely implicated. In her message to Prime Minister, Chawla stated that these 17 Indians, facing death sentence, should immediately be given all kinds of legal support and assistance so that their lives could be saved. The visiting pilgrims reached here today to end their month-long pilgrimage in India. They arrived in India from the Attari-Wagah joint check post on March 5. Makhija said members of the group comprised followers of Sadani Darbar, a sect of Hinduism, and they came here annually for a pilgrimage. He dubbed annual visas to Pakistani Hindus for pilgrimage as insufficient and demanded that they must be allowed to visit their religious places here twice a year. Similarly, he opined that Indians must also be permitted to visit their religious places in Pakistan. He said there were about 350 historic religious places related to Hinduism spread across four states of Pakistan. He asserted that frequent exchange of visits between the citizens of two countries would eliminate misconceptions and help in evolving long-lasting relations. Another member of the visiting group, Gian Chand, said there were many members among them who got a chance to visit the religious places here after a gap of 10 or more years. He said during the month-long pilgrimage, they visited Amarkantak, hermitage of Kapilmuni, Raipur, Chitrakut, Amravati, Allahabad, Delhi and Haridwar. During the two-day-long stay here, they will pay obeisance at the Golden Temple, Durgiana Temple and will pay tributes to the martyrs at Jallianwala Bagh. They will return to Pakistan on April 3. Special committees have been constituted to study various aspects of the Act and compare it with the situation on the ground. “These panels include both educationists and representatives of the general public and have been asked to suggest to the government what need to be done to make the implementation of the Act effective,” said Director-General, School Education, Krishan Kumar. 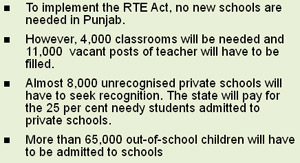 “The first priority is the 65,000 out-of-school children in Punjab. The majority of these belong to migrants. Of these, over 30,000 are over the age of six years. As a run up to the implementation of the Act, we have started learning centres inside some schools where these children are undergoing bridge courses before they are admitted to their class. It is a Herculean task but we will be able to show results,” said Krishan Kumar. With regard to infrastructure and teachers, Punjab is on a stronger footing than many other states. “We will only need about 4,000 extra classes in schools already running for the implementation of the Act,” said Krishan Kumar. The Act states that there should be a school in every neighbourhood. “Till the neighbourhood is defined, we cannot say if we will need to construct more schools or not. However, we have at least one primary school in each village. Some villages have more than one. And there is an upper primary school for every two villages. This is the ideal ratio as laid down in the Government of India,” he said. Almost 8,000 unrecognised private schools would have to be brought under the government’s control. Many of these schools are running from small buildings without much infrastructure. The model provisions of the Act have identified the minimum standards for private schools. “Recognition will be done by the Education Department, whether a special committee does it or district-level officers do it is yet to be decided,” added Krishan Kumar. The Act will lead to a larger government control over government schools. Though the Act does not lay down any restriction on fee that is demanded by private school, every penny paid by the parent would have to be notified by a private school. A private school will also have to provide the midday meal. The good news for teachers is that other than elections, census and disaster duties, they will not be asked to do anything beyond teaching. “However, they will have to do education-related survey work,” said Krishan Kumar. The group, led by former Chief Minister Capt Amarinder Singh which was earlier sidelined when the Pradesh Congress announced the district scrutiny committees last month, seems to have partially succeeded in making them more representative. PPCC returning officer for the organisation elections - Usha Thakkar - reconstituted the scrutiny committees yesterday by including party leaders both from the organisation as well as legislators and MPs. According to party general secretary Parminder Singh, the scrutiny committees had been extended as per the directions of the All-India Congress Committee (AICC). He said it was felt that all sections of society, particularly the SCs, backward classes and women should get proper representation. The district committees have now been directed to complete the scrutiny work by April 7. According to the PPCC, now all 135 block presidents, 25 mahila Congress district presidents, 25 women Scheduled Caste cell chairpersons, 29 legislators belonging to the SC and backward class categories, 78 former and present legislators, all 13 leaders who stood for elections to the present Lok Sabha, four heads of frontal organisations and 25 SC cell chairmen would be part of the district scrutiny committees. Earlier, each district scrutiny committee constituted by the state returning officer included the district president, former legislator and three block presidents. There were protests by a section of legislators, including some Amarinder supporters, that the committees were tilted against them. With the reconstitution of the committees, the issue of the recruitment of fake members could be raised again. This is because of the unprecedented 32 lakh members recruited by the PPCC. In comparison, Haryana has recruited only 3 lakh members. A few senior Congress leaders have already complained to the returning officer that proper norms were not followed while conducting the recruitment drive. President, National Sikh Gurudwara Parbandhak Committee and representative of Associazone Sikhismo Religione Italia, Harwant Singh Daduwal said they had been forced to take these steps as their repeated pleas made to various functionaries of Indian government, including Union Minister concerned to take action against the erring officials of embassy fell on deaf ears. He alleged that a section of officials of embassy had been forcing the baptised Sikhs to remove the sword, worn by them as their religious symbol, before allowing them entry into the premises of the embassy. The Sikhs were upset and agitated over this action of officials of embassies. “We are being badly misbehaved, disrespected and unheard by these offices when we go to them to take some help for our genuine and legal problems, which are being lingered on deliberately. A section of officials have created some illegal agencies to earn money through these persons,” alleged Daduwal, while talking to The Tribune on phone today. “Our organisation has taken permission to stage a dharna and hold a protest march on April 2, 2010, from the government of Italy. We have requested other organisations of Indian community dealing with sports, immigration, cultural activities and other social acts to join the agitation,” disclosed Manjeet Singh, another representative of the National Sikh Gurudwara Parbandhak Committee. The sources in Union External Affairs Ministry revealed that the Indian government was already seized of the matter and had been trying to find out a solution of the problem being faced by the members of Indian community in Italy. It is learnt that the state Food and Supplies Department authorities had empowered a contractual employee of Pungrain to look after the work of the Finance Department of Food and Civil Supplies, Punjab, despite the fact that these powers were always vested in Controller Food Account (CFA), appointed by the state Finance Department. It is learnt that the authorities concerned had also appointed two District Food and Supply Controllers (DFSCs) in various districts of the state in the recent past despite the fact that the Punjab government had not sanctioned two posts of the DFSCs in such districts. According to the documents available with The Tribune, MS Sarang, Financial Adviser (contract basis), Pungrain, was empowered to look after work of the Finance Department of the Food and Civil Supplies Department in 2008 by SP Singh, the then Director and now Secretary, Department of Food and Civil Supplies, Punjab. Agitated over these kinds of development, Arunesh Shakir, Chief Parliamentary Secretary, Food and Supplies Department, Punjab, said he was neither consulted by Adesh Partap Singh Kairon, Minister, Food and Supplies, nor taken into confidence by senior functionaries of the department while taking such decisions. He added that he would take up the matter with Chief Minister Parkash Singh Badal. He said he would like to bring transparency and accountability in the functioning of the department. SP Singh said he was competent to appoint a contractual employee of Pungrain to look after the financial matters of the department. Keeping this in view, the condition of government-run schools in the rural areas can be well imagined. The school with 525 students has only 8 sanctioned posts of teacher. However, the RTE Act, effective from today, lays down that there shall be two teachers for a student strength of up to 60. The teachers were expecting more students to enrol in the next few days. Several students were struggling to get their bowl filled with rice and curry (mid-day meal) that was being distributed when this correspondent reached the school around noon. Baljinderpal, a teacher, said the meal had fallen short today, as the number of students had suddenly increased to 525 today from 327 yesterday. However, arrangements were made to feed the remaining students. Lakhwinder Kaur of the self-help group that prepares mid-day meal for students of the school, said the government provided only dry ration, including wheat and rice, under the scheme and she was being paid a paltry amount of Rs 2.50 for serving curry and vegetable to each student. The cost of cooking food had also to be borne by the group. The school has only six classrooms, thereby resulting in about 88 students sharing the congested rooms. Many students were taking classes in the corridor and two separate classes were being held in one single room. With 164 students on the rolls in the 1st class, three sections have been made with about 54 students each, whereas the RTE provides for one teacher for every 30 students. Similar was the scenario in the other elementary schools in the Amarpura, Haji Rattan, Lal Singh Basti and Guru Nanak Pura localities within the city. This was what officials of a special flying squad of the board found during the conduct of the secondary class held on last Tuesday at two examination centres in Punjab’s border district, one at a girls school in Khem Karan, Tarn Taran, and the other at a private school in Rayia, Amritsar. Working opposite to the claims of the State Education Department of having brought down mass copying, a group of people descended at the Government Girls Senior Secondary School, Khem Karan, during the conduct of secondary class science paper. Hundreds of persons were seen outside and inside the school soon after the paper began at 9 am, despite the Deputy Commissioner, Tarn Taran, having enforced Section 144 of the CrPC on gathering of persons outside the examination centres. Having placed itself at a distance from the examination centre at about 7.30 am, two hours before the exams, the team led by the Controller of Examination, Dr Jagtar Singh Khatra, to its utter surprise found that there was huge rush of people, including students, vying to buy pocket guides from a few shops in the area. Apparently, the pocket guides were the clue of copying success during the exams. Almost 30 minutes after the exam began, the question paper was being solved outside the examination centre and the solved question papers were being pushed back through broken windows into the examination centre. “After seeking enough police force from the SSP, Tarn Taran, we raided the three-storied examination centre. People were running helter-skelter. A thorough check on two of the floors yielded bag full of pocket guides, chits, and solved question papers,” said the controller. Three government servants, two from health and another from the Treasury Department, were found helping the students. Bags full of cheating material, solved question papers of pervious examinations were found littered in the compound of the examination centre, indicating the state of affairs during the previous examination days. At the top floor of the school, housing the examination centre of the open schools, the officials caught 13 cases of impersonation red-handed, in which persons other than the students were found appearing in the examination. All have been arrested by the police and booked for impersonation. The authorities were also questioning the role of centre in charge Yadwinder Singh, who is also the principal of the school, and the staff on examination duty. At Montesarri Public School, Rayia, Amritsar, the raiding team found that a teacher in one of the examination room was holding a pocket guide. A lot of copying material was found from the students. An Almirah next to the examination rooms was found full of pocket guides. Besides, blacklisting the examination centre, the board was taking suitable action against the erring officials on examination duty. Chief Minister Parkash Singh Badal on Wednesday gave an in-principle approval to the Vice-Chancellor of Guru Nanak Dev University, Amritsar, to open a centre to prepare rural students for admissions to IITs from the academic session 2010-11. Badal has directed the planning secretary to make a budgetary allocation of Rs 139.17 lakh for the proposed centre in the state's annual plan. “This is a step towards the holistic development of rural students. We are following the pattern of Bihar where a non-government organisation (NGO) run by some professionals imparted coaching to bright students from downtrodden sections,” said AS Brar, Vice-Chancellor of GNDU, here yesterday. “Their group is called 'Super 30' and they are providing free coaching, food and accommodation to the students. All the 30 students of the 2009 batch were able to get admission into an IIT. Thus, there is an immediate need to replicate this successful model in our state,” said Brar. The Punjab government will open this centre at Khalsa College Public School in Amritsar and Brar will be the chairperson of this centre. Notably, it was for the second time that ruckus was allegedly created by the MLA at the auction for the sale of the fancy number in Ajnala. DBA president Rakesh Gupta stated that executive committee of the Bar had decided to observe a full-day strike tomorrow. “We strongly condemn the attack and non-registration of case against the MLA,” Gupta said. Inspection teams visited schools of the district in order to check proper record of attendance and the teaching methods being employed from day one. District Education Officer (Secondary) Surinder Kaur Verma, said , “The attendance of students on the first day varied from 60 to 70 per cent in different schools. Also, the books from the department have reached the schools and have been distributed among students. The books for SC students are yet to reach schools. Teachers have already maintained their diaries and were following proper time-table since the first day,” she said. Rice shellers of Fatehgarh Sahib and adjoining areas have expressed their concern over the rotting stocks in rice shellers where milling has come to halt. State press secretary of the Punjab Rice Millers Association Nakesh Jindal said nearly 60 lakh metric tonne paddy was still stocked in the rice shellers of the state. District president of the association Inderjit Singh Sandhu said the owners of rice shellers were already upset over increased discoloration and damage in the rice being purchased by government agencies that has delayed milling. Now with the last date for handing milled rice ended, they owners are unable to save paddy stocked in their shellers. “Despite repeated representations and requests to the authorities concerned, no action has been initiated in this regard nor have they assured us to extend the date for milling,” said Sandhu. The sheller owners rued that the quality of rice was reducing day by day due to rise in temperature and was a cause of worry. “Rice grain breakage would also get accelerated due to change in weather in next few days,” he said. Demanding extension of date, rice shellers said government should arrange more silos to get rice stored. One of the main reason Punjabi farmers gave banana a complete miss earlier was that it used to get infected by virus very soon and the whole crop would then get destroyed. The Punjab State Farmers’ Commission, aided by Punjab Agricultural University (PAU), then developed tissue-cultured saplings that do not carry any virus nor require any pesticide spray. “This way, the tissue-cultured banana is chemical free. To make things easier, we are coming up with ripening chambers at various districts wherein the crop can be ripened using the latest ethylene gas technology,” PFSC chairman GS Kalkat said. The newly introduced tissue culture technology has enabled small and marginal farmers in state to opt for this crop that yields good returns. 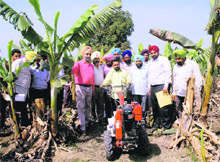 Aided by the PSFC, Mewa Singh from this village opted to cultivate banana in February 2007. “In the first year, the sowing got delayed due to frost. However, in second and third year subsequently, I earned great profits. My success convinced fellow farmers who have now formed the Banana Growers’ Association and are cultivating it at a large scale,” he said. Already 250 acres of area is covered under banana cultivation in the state, particularly in pockets of Jagraon, Jalandhar and Malerkotla. The PFSC targets to cover 500 acres under banana cultivation. “We would easily meet our target as many farmers are keen to have this crop. We fear running short of tissue culture plants to meet with the increased requirement,” pointed out Pritam Singh Rangi, PFSC marketing economist. He added that the annual banana consumption in the state is worth Rs 500 crore, wherein the fruit is bought from other states. Using the tissue culture banana crop, farmers can earn up to Rs 1 lakh per acre annually. The total cost of banana plantation is about Rs 50,000 per acre in the first year and around Rs 30, 000 per acre for each of the three rotations of the crop during the next three years. “If small and marginal farmers take up banana cultivation extensively, they can cater to the needs of neighbouring Haryana and Himachal Pradesh as well,” he added.